Should the Redskins Roll the Dice on Dez? The Redskins have a tempting choice this weekend. Do they make a run for Dez? As in Dez Bryant. It’s been the talk of Washington and the NFL on a warm, summer Friday as the Capitals failed to seize center stage on Thursday and fans are in a wait-and-see mode on the Wizards. The Redskins are apparently telling reporters that cover the team on a daily basis that they are not interested. At least for now. That doesn’t mean it will stay that way and Washington might be tempted by Bryant’s potential fit and being hell-bent on revenge against the Cowboys. So how would Bryant fit with Washington? Bryant could and would the Redskins best red-zone option if/when Jordan Reed gets hurt or is unavailable and even if Reed is healthy, Bryant would give the Skins offense another threat in troubled waters. Bryant no longer has electric speed to match his size, but he can still work the fades and back-shoulder throws that Jay Gruden likes to run. 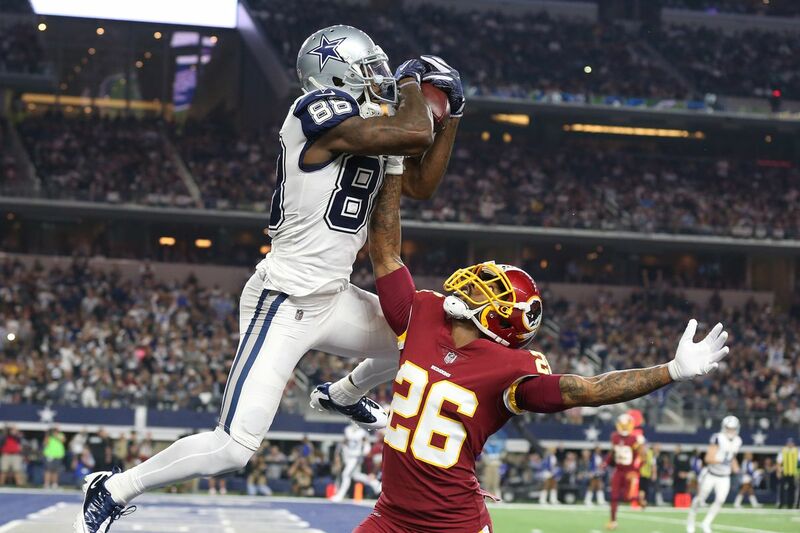 He can still “climb the ladder” as the Redskins saw in person in early December as Bryant beat Bashaud Breeland on a contested touchdown. Bryant can work from the slot or outside and still could be a matchup problem with smaller corners in a compressed space. This isn't a wacky print or radio bit, this is a more than legitimate possible fit Former NFL general manager, Michael Lombardi, feels that Bryant could certainly be a fit in the Redskins offense. Bryant seems to be taking his frustration out on Cowboys’ coaches for the decision to let him go and also mentioned via twitter that he was looking forward to seeing the Cowboys twice, presumably meaning that he would like to sign with a division rival of the Cowboys. That would mean the Eagles, Giants or the Redskins of course. Per OvertheCap.com, the Eagles have the second-lowest amount of cap space remaining at $1.8 million. The Giants have $4.8 million and Washington has $17.25 million. That doesn’t include the rookie allocation pool teams must essentially reserve. The Redskins, per the same website, are expected to need just over $7 million to sign their rookies. That’s a variable number, but essentially it should leave the Redskins about $10 million left over and enough room, IF THEY WANTED to sign Bryant. For now, they apparently do not want to but that doesn’t mean you can’t make a good argument for it. The Redskins signed Paul Richardson to be the speed demon and compliment Josh Doctson, who if he’s healthy, could be similar to what Bryant was in his prime. Washington also has Jamison Crowder in the slot as their top three receiving options. There’s not a lot of “need” that is easy to see, despite the Redskins losing Ryan Grant via free agency. But could you make a case for making a hopeful strength a better strength? Yes, you could. Bryant, per James Koh of NFL Media, only had 14 receptions on 31 targets for 117 yards, no scores and a target that was intercepted out of the slot in 2017. That was based on NFL NextGenStats. Crowder is coming off a very difficult season as both a punt returner and a slot receiver. He struggled to stay healthy and had plenty of difficulties holding onto the football in both roles. He’s a year away from becoming a free agent, as well. Richardson has had trouble staying healthy in his career and naturally a role could evolve there, even though Bryant and Richardson are very different players and the most natural fit would be Doctson’s role. Bryant had 69 receptions for 838 yards and six scores in 2017. His touchdowns were down from 2016, as was his per catch average, which went from 15.9 in the Cowboys division winning year to 12.1 during an uneven final season with a star on his helmet. To be fair, his volume of catches went from 50 to 69 over the last two years and he had 838 yards in his final season playing for Jason Garrett. That was up slightly from 2016 as well. Then you have to consider Bryant’s tendency to lose his cool and yell at coaches and fellow players on the sidelines. Sure, he’s emotional and sometimes that is good. Sometimes it’s not. The Redskins do not strike me as taking a risk personality wise unless they view the player as special. Bryant used to be special, but he hasn’t been for various reasons in several years. Would they take a chance on the money that it will take, without a huge need and to potentially upset what is a very comfortable, loose locker room and atmosphere? Probably not. Now and in the future. Should they? That’s a different question, but as much as it would add some sizzle, I would say no as well. It’s not a slam-dunk no, but I’d pass if I were Jay Gruden and Washington. A Final Grade For the Redskins! The Redskins concluded their 2018 draft and by most accounts, while there's always risk and conjecture, Bruce and the boys did pretty well. How well? That remains to be seen. We give our report card grade with some analysis and say thank you! The Redskins hope to bring the pain this year to opponents by drafting Alabama's Da'Ron Payne in the first-round Thursday night. He's young, explosive (at times) and disruptive. For Washington, they have to hope they haven't reached for a player that will flash but not be consistent on the NFL level.